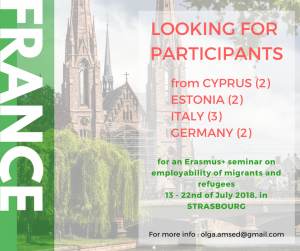 AMSED is organizing a seminar on employability of migrants and refugees in Strasbourg, France, between the 13th and the 22nd of July 2018. The project is called : Acting together for the socio-professional inclusion of migrants and refugees and is financed by the Erasmus+ program. Our partners in Estonia (NEA MTÜ), Cyprus (CARDET), Italy (Giosef Unito) and Germany (Jubuk) have a hard time finding participants for our project, this is why we decided to do an OPEN CALL for participants from these 4 countries and we are hoping you can relay the message to other NGOs in your network. We are looking for 2 participants from Estonia, Germany and Cyprus and 3 from Italy, aged 18 and above, motivated to participate in the project and available for the entire duration of the seminar. Below you will find a short description of the main objectives of the project and in attachment the application form and the InfoPack of the seminar. ACTING TOGETHER FOR THE SOCIO-PROFESSIONAL INCLUSION OF MIGRANTS AND REFUGEES – Seminar of sharing best practices and creating tools. At the end of 2015, the European Commission estimated that the expected increase in the labor force (linked to the influx of refugees) “could result in additional employment once the refugees with sufficient skills enter the labor market”. These claims are confronted with realities on the ground where refugees and asylum seekers, depending on the country in which they find themselves, have to wait from 2 to 18 months to be able to access the labor market. With the aim of reducing social inequalities, this seminar brings together 14 EuroMed countries represented by NGOs from Germany, Austria, Bulgaria, Cyprus, Spain, Estonia, Hungary, Italy, Morocco, Romania, Tunisia, Turkey, Ukraine and France. General objective of the project is to train 45 youth workers from the Euromed area by providing them with the skills, attitudes and knowledge necessary to understand the issues of migratory flows and by transferring methods to act adequately in the field of inclusion and Youth. Participants will gain knowledge and tools that strengthen their cross-curricular skills, initiative and network, and will be the source of recommendations and citizen initiatives related to the inclusion of refugees, through an educational toolkit in the form of a socio-educational and professional inclusion guidebook ‘I made my new start’, thus contributing to building an inclusive and egalitarian Europe. – To gain an understanding of the situation / problems related to the socio-professional inclusion of young refugees and migrants. – Disseminate the results of the project. The project will take place from 13 to 22 July 2018, in Strasbourg, France. Travel expenses are reimbursed based on the distance calculator of Erasmus+ program (180€ for Italy and Germany, 275€ for Estonia and 360€ for Cyprus per person) and there is a project participation fee of 50€. Don’t hesitate to spread the message in hopes that we can find participants in time for the project.